Quinoa (pronounced as kinwah; quinua in Spanish) is an incredibly nutritious "grain-like seed" obtained from the goosefoot family plant native to the highland plains of South-American Andes region. Ancient Incas believed quinua as “the mother grain,” since eating it as food would confer them long-lasting healthy life. The crop was once the staple food sources of Incas before the Spanish explorers forced them to abandon its cultivation. Quinua is a goosefoot (Chenopodiaceae) family of annual herbs. White goosefoot (C. album), and Good King Henry (C. bonus-henricus) are some of the closely related species. Scientific name: Chenopodium quinoa. Botanically, chia is a low-growing herb in the mint family of plants. Scientific name: Salvia hispanica. Quinoa seeds. Note for oval, creamy-white colored seeds. Quinoa does not belong to the cereal-class of staple grains. Instead, it is a seed, much similar to other dicotyledons such as amaranth, and legume family plants. Nonetheless, its seeds feature proportionately less fat content than oil seeds, and hence treated in a way like any other staple grains. The quinoa plant reaches about 3-6 feet in height and prefers well-drained, neutral PH and sandy soil. It, however, can thrive well in harsh environmental conditions and alkaline (salty) soils. For the same reason, it is being cultivated as one of the chief crops under rain-shadow highlands of Bolivia, Peru, Chile and Ecuador since ancient times. At its natural habitat, quinoa begins flowering (inflorescence) in July which subsequently develop into edible seeds by the end of August through September. Its seeds measure about two mm in diameter, appear like that of amaranth seeds, and feature white, gray, pink to pale brown colors depending upon the cultivar type. Quinoa seeds exhibit outer seed coat containing bitter substances known as saponins, which should be removed before eating. Quinoa indeed has found renewed interest, particularly among the food scientists, because of its sustainable characteristic of thriving well under stress growing conditions. Additionally, it's well-balanced protein, fat and mineral composition can be an answer to malnutrition alleviation in famine-prone regions around the world. 100 g quinoa seeds (grains) carry 368 calories. Its grains are modest sources of energy, and their calorie content may be matched to that of some of the major cereals such as wheat, maize, rice, and that of pulses like chickpea, mung bean, cowpea (black-eyed pea), etc. Quinoa grains carry 14-18 g of protein per 100 g. They compose almost all of the essential amino acids required for the human body at great proportions, especially in lysine which is otherwise a limiting amino acid in grains like wheat, maize, rice, etc. Quinoa is one of the gluten-free staple foods. Gluten is a protein present in certain grass family grains like wheat, which may induce stomach upset and diarrhea in individuals with gluten sensitivity or celiac disease. The grains are a rich source of soluble and insoluble dietary fiber. 100 g provide 7 g or 18.5% of daily requirement of fiber. Fiber increases bulkiness of the food and thus helps prevent constipation by speeding up its movement through the gut. In fact, the gastro-intestinal transit time of food is greatly decreased. It also binds to toxins, aid in their excretion from the gut, and thereby, helps protect the colon mucosa from cancers. Also, dietary fibers bind to bile salts (produced from cholesterol) and decrease their reabsorption in the colon, thus help lower serum LDL-cholesterol levels. Quinoa grains are indeed an excellent sources of the B-complex group of vitamins, vitamin-E (α-tocopherol) and essential fatty acids such as linoleic and α-linolenic acid (18:3). 100 g of grains contain 184 µg or 46% of daily required levels of folates (B9). Young, tender quinoa greens (leaves and shoots) and flowerheads are excellent sources of vitamin-A, folate, and antioxidants such as lutein, carotene, cryptoxanthin, and zeaxanthin. Yellow and red type seeds also rich in these pigment antioxidants. Altogether, these compounds indeed function as powerful antioxidants by removing harmful free radicals from the body thus protect it from cancers, infection, aging and degenerative neurological diseases. Quinoa is an excellent source of minerals like iron, copper, calcium, potassium, manganese, and magnesium. Copper is required for the production of red blood cells. Iron is essential for red blood cell formation. Magnesium relaxes blood vessels leading to brain and found to have healing effects on depression, and headache. Zinc is a co-factor in many enzymes that regulate growth and development, sperm generation, digestion and nucleic acid synthesis. Potassium is an important component of cell and body fluids that helps controlling heart rate and blood pressure. The human body uses manganese as a cofactor for the potent antioxidant enzyme, superoxide dismutase. 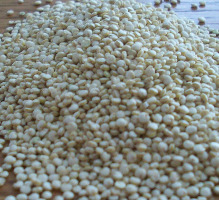 Quinoa is not a cereal grain, but a dicotyledon seed (minute fruit) of goosefoot plant. Nonetheless, it has been treated like grain and consumed as one of the chief food sources along with potato and maize since ancient times by native Andean inhabitants. It features all the characteristics of a seed and composes right proportions of all the essential amino acids, fats, starch, fiber, minerals, and vitamins. Quinoa oil, extracted from its seeds indeed is an excellent source of essential fatty acids and vitamin-E.
Quinoa nutrition chart, values per 100 g.
Dry quinoa seeds, raw and processed can be readily available all around the season in the US stores. Being an unnaturalized crop in the USA, quinoa has to be imported from Bolivia, Peru, and other South American countries. Processed seeds generally sold in airtight packets and bulk bins. Look for fine, dry grains roughly the size of pearl millet. They come in different colors, ranging from creamy-white, pink, yellow to deep brown, depending on cultivar variety. At home, store the grains in an airtight container in cool, dry place where they stay fresh for several months. Ground quinoa flour, however, exposes their essential fatty acids to environmental factors which may initiate rapid lipid peroxidation and reduce its lifespan. Therefore, mill its grains as and when required and store its flour in an air-seal container. Sopa de quinua- quinua soup. The unprocessed quinoa grain has a thick outer coat (hull) that must be removed before fitting for consumption. This outer coating contains an anti-nutrient compound, Saponin that has a bitter, soapy taste. Virtually, all the available grains of quinoa in the US stores are de-hulled and pre-washed. At home, wash in cold water repeatedly until all of its foam disappears before cooking. Quinoa cooked in the same way as you cook other staples like buckwheat, rice, etc. Roughly, one cup of dry grains cooks to three cups. Cooked quinoa becomes fluffy, chewy and attains pearl like translucency and pleasant taste. Mixing quinoa floor with other cereal flours such as maize, wheat, oat, etc., enriches overall protein quality of the meal, compensating for the limiting amino-acid level of grains. 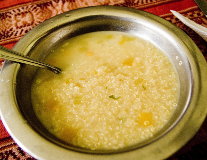 Traditionally, native Andeans used quinoa seeds to prepare porridge, soup and milled into flour to make bread, porridge (lawa), buns, polenta, and non-alcoholic cold drinks (quinua chicha). In the rest of the world, its grains used in many ways like any other cereal grains to make pilaf, porridge, flakes, puddings, etc. Its flour may be used in numerous methods to make bread, bun, cake, pasta, noodles, cookie, biscuits, etc. Young, tender quinoa leaves (chiwa) and flower heads are also eaten like leafy vegetables and indeed, make good salads, stews, and soups mixed with amaranth, spinach, and beet leaves. Cold-pressed quinoa oil has been one of the sought after oil used as dressing as well as cooking oil in place of rice bran or corn oils. Unpolished (unwashed) quinoa seed contains in its outer cover saponin, a triterpenoid compound. Saponin has a bitter soap-like taste which when consumed might result in stomach pain, flatulence, and laxative diarrhea. Naturally, this covering over the grains protects them from insects, and birds. Quinoa leaves and flower-heads compose oxalic acid and should be blanched in boiling water before being eaten. (Medical disclaimer). <<-Back to Nuts and seeds from Quinoa nutrition. Visit here for an impressive list of nuts and seeds with complete illustrations of their nutrition facts and health benefits.